The cardamom seed spice is a beloved favorite in Asian, Middle Eastern, and European culinary dishes. It's known to aid digestion and stimulate gastric juices. It was even used by the Ancient Egyptians and Arabs as a go-to remedy for the digestive system. You can also reap some of these health benefits from its essential oil form. Cardamom essential oil boasts an exhilarating fragrance that is grounding. It's earthy notes help to promote relaxation and perspective. This essential oil spices up the scent of any room and can be used in several different ways to promote digestion and overall health. Cardamom oil is extracted from the seed plant parts of the cardamom plant known by the botanical name Elettaria cardamomum. This plant is part of the ginger family known as Zingiberaceae, which also includes turmeric. The cardamom plant is native to the Indian subcontinent as well as Central America. Cardamom oil is largely produced in Guatemala and India. The main constituents of cardamom oil are terpinyl acetate, linalyl acetate, and 1,8-cineole, which boast anti-inflammatory and antibacterial properties. Cardamom oil also has high concentrations of calcium and phosphorous along with amino acids. Like most essential oils, it's also packed with antioxidants that are good for health. 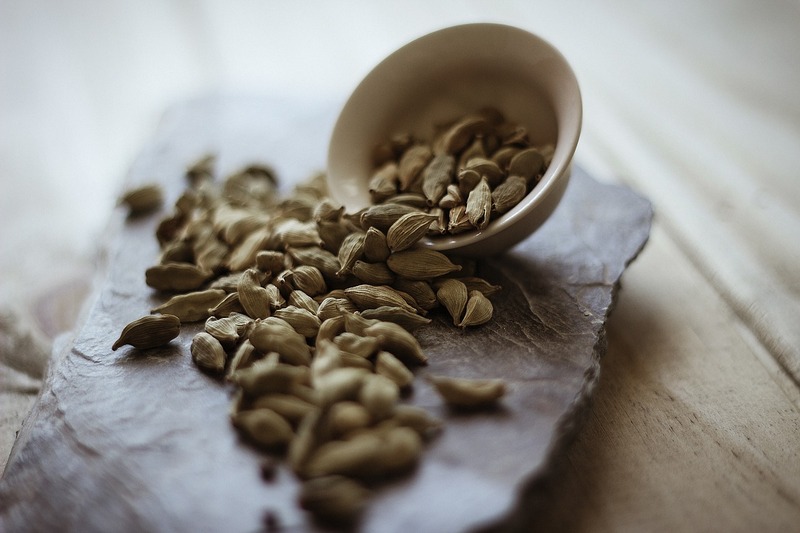 The Ancient Greeks and Romans used cardamom for its pungent aroma. It became a staple ingredient of perfumes and aromatic ceremonies. Cardamom is more expensive than other oils because the production process is labor intensive. It is the third most expensive spice in the world after saffron and pure vanilla. The seeds must be harvested by hand before they undergo a process of steam distillation to extract the oils. Recently, farmers have discovered cardamom varieties that produce high-yields. The hope is that higher yields will help to bring the cost down, making this spice and its oil more affordable in the future. Cardamom oil has a smooth and alluring aroma that is often described as intoxicating and nurturing. The aroma of cardamom oil is sweet and spicy with woody undertones. This oil also boasts fruity and balsamic middle notes. This essential oil blends well with citrus oils such as wild orange, lemon, and bergamot. It also complements floral oils such as rose oil and ylang ylang oil and earthy oils such as cedarwood oil. The spicy notes pair well with other spiced oils including clove bud oil and black pepper oil. Just like cardamom spices give food flavor, cardamom oil can delightfully scent a home. This oil produces a warm aroma that can increase relaxation and help ground emotions. The sweet and spicy fragrance can soothe frayed emotions after a long day. Cardamom also has a slightly floral scent that can induce relaxation while the spicy notes help to energize and improve mental clarity. Add 3 to 4 drops of cardamom oil to an ultrasonic or nebulizing diffuser. Settle into a comfortable chair and breathe in the aroma to induce relaxation after a tough day. You can also add 2 to 3 drops of the oil to a personal diffuser and take it with you on the go. Alternatively, add 2 drops cardamom oil and carrier oil to your hands. Rub palms together, cup beneath your nose and mouth, and inhale deeply for 2 to 3 minutes. Cardamom oil has antibacterial and disinfectant properties that make it useful for protecting oral health. A 2009 study examined the effects of cardamom oil against oral bacteria that cause oral yeast infections and digestive disruptions. The results showed that cardamom oil was effective in eliminating Candida albicans and Staphylococcus aureus. The researchers found cardamom oil to be an effective treatment of tooth decay. Eliminate bad breath with a cardamom oil mouthwash. Add 2 drops cardamom oil to a tablespoon of water. Swish in your mouth for 30 seconds before spitting and rinsing. Cardamom oil's warming effect can also help to boost immune health and fight off a cold or flu. The warmth helps to relieve chest congestion while antibacterial properties help to fight off the invaders that cause colds in the first place. The soothing properties of cardamom also help to alleviate cough by reducing inflammation in the chest and respiratory system. A study published in the Journal of Medicinal Food found cardamom oil has immunomodulation properties. The oil was found to enhance the efficacy of immune cells that fight off bacteria. Diffuse 3 to 4 drops of cardamom oil during cold and flu season to boost immune health. You can also aid recovery with a cardamom chest rub if you already have a cold. Melt 2 tablespoons of beeswax and 1/2 a cup carrier oil in a large skillet. Add 20 drops each of eucalyptus oil, peppermint oil, black pepper oil, and cardamom oil. Stir well and add to a large glass jar. Rub gently onto the bottoms of feet or on your chest to relieve congestion and reduce cough. Cardamom essential oil is stomachic—meaning it helps to regulate healthy digestive processes. The oil helps to regulate the production of gastric juices such as bile that help to breakdown foods. Cardamom oil also has carminative properties that help to reduce the incidence of bloating, gas, and indigestion. Cardamom also contains fiber, which helps to improve digestive function. Inhale the fragrance of cardamom oil before or after a meal to promote healthy digestion. Use 2 to 3 drops in an ultrasonic diffuser or simply dab a few drops along with carrier oil on your wrists or behind your ears. The warming nature of cardamom oil helps to boost metabolism and may help increase weight loss. 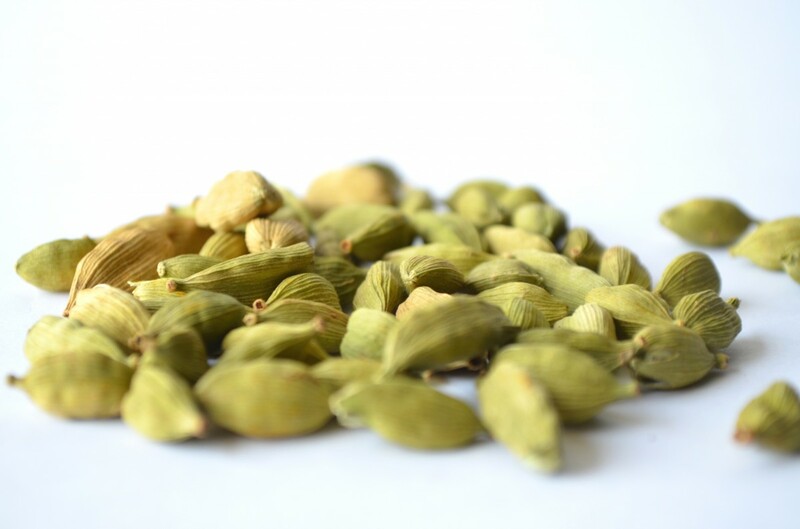 Cardamom naturally elevates body temperature, which signals the body to burn fat stores for energy. A study published in Lipids in Health and Disease found that cardamom was able to reduce fat deposits in rats with high carbohydrate and high fat diets. Cardamom may also be beneficial in preventing diabetes and heart diseases associated with obesity. A study published in the Journal of Diabetes and Metabolic Disorders investigated the effects of cardamom on fat in humans. The study consisted of 80 obese or overweight women who were pre-diabetic. The participants were divided into 2 groups. The experimental groups received 3 grams of green cardamom while the placebo group received 3 grams of rusk powder. All participants were monitored for two months. The results showed that the women who took cardamom had significantly lower cholesterol and increased insulin sensitivity. More research is needed to demonstrate conclusive results for humans. However, the warming effects of cardamom have shown promise in boosting metabolism and increasing fat burn. Diffuse a few drops of cardamom oil before or after a meal to boost metabolism. Make a potent weight loss diffuser blend by combining cardamom oil with grapefruit oil and cinnamon oil. You can also reap these health benefits by applying cardamom oil topically. Combine 3 drops cardamom oil with a teaspoon of carrier oil. Massage into skin and enjoy the warming effects that speed up metabolism. Smoking is one of the leading causes of premature death in America. Many people try to stop smoking, but find the process difficult and experience relapse. Nicotine withdrawals can be severe and include symptoms such as irritability, anxiety, depression, and weight gain. Some people also find it difficult to concentrate and have trouble sleeping. Researchers have found that cardamom oil may help to lessen the severity of nicotine symptoms, thus helping people stop smoking more easily. A study published in Addictive Behaviors examined the effects of three different gum flavors on nicotine withdrawal. The study was comprised of 49 smokers who abstained from smoking for 48 hours each week over a 4-week period. The participants were given either peppermint chewing gum, vanilla chewing gum, cardamom chewing gum, or no gum. All participants who chewed gum reported lower levels of anxiety and tension. The patients who chewed cardamom gum had significantly better results than the patients who chewed other gum flavors. Oil pulling is similar to mouthwash, except that only oils are used. Combine 4 drops cardamom oil with a teaspoon of carrier oil such as coconut oil. Swish the oils around in your mouth for 2 to 5 minutes any time you feel anxiety or cravings associated with nicotine withdrawal. Spit and rinse when finished. Cardamom oil is generally safe for use when used in small amounts. Excessive concentrations of the oil can lead to toxicity including symptoms of stomach upset, diarrhea and increased body temperature. Most side effects can be avoided with proper use and dosage. Cardamom oil can cause skin irritation in certain individuals. Always apply essential oils topically with carrier oil such as grapefruit seed oil, avocado oil, or coconut oil. Test the oil on a small patch of skin before applying in larger amounts. Do not use cardamom oil if you are allergic to the cardamom plant. Keep the oil away from sensitive areas such as your eyes, nose, and mouth. Women who are pregnant should not use cardamom oil. This oil produces a warming effect that can irritate or harm the baby. Always talk to a licensed healthcare provider before using essential oils when pregnant or breastfeeding. The high price of cardamom oil has led to the production of cheaper, synthetic alternatives. We recommend always using only high quality, pure essential oils to avoid side effects. Synthetic oils may be more affordable, but they often contain harmful chemicals that can irritate skin and cause negative reactions. Only use therapeutic grade essential oils in aromatherapy to avoid damaging or stressing respiratory health. The Food and Drug Administration has rated Elettaria cardamomum Maton safe for human consumption in accordance with their intended use. Essential oils should only be consumed orally under the supervision of a licensed aromatherapist or physician. Cardamom essential oil should only be taken in small amounts to avoid negative side effects. Cardamom is a flavorful spice that produces a delightful warming essential oil. 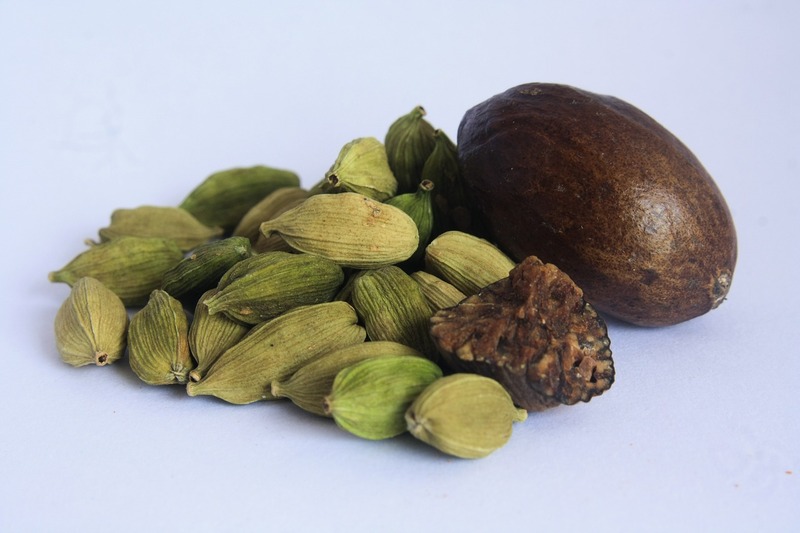 Cardamom essential oil can stimulate digestive processes helping to improve overall health. Antibacterial and anti-inflammatory properties also help to relieve symptoms and causes of the common cold. Adding this oil to your health regimen may help to increase metabolism and even out mood. Try diffusing it or applying it topically for the best results.